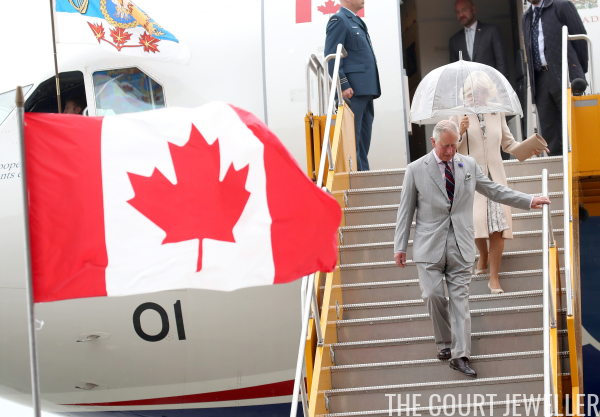 The Prince of Wales and the Duchess of Cornwall continued their Canadian tour in Ontario on Friday, and the jewelry worn had a distinctive military flair. 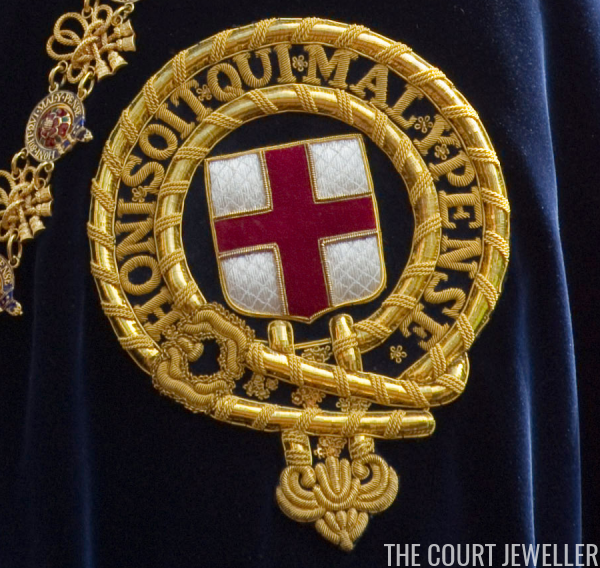 We've got some wonderful and unexpected pieces in this week's royal jewel review! Don't forget to vote for your favorites in the poll below! 10. 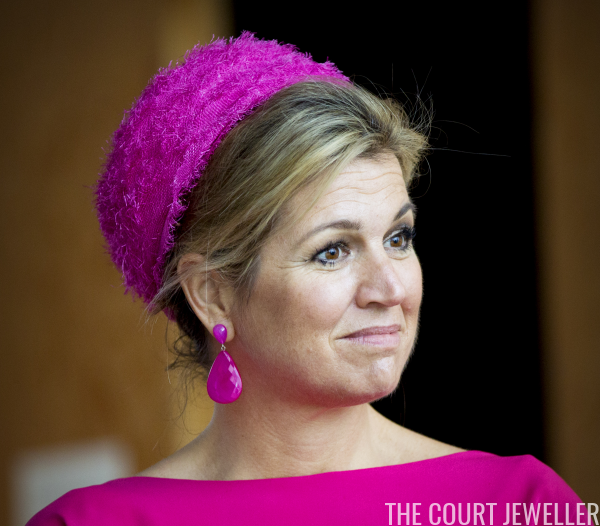 Queen Maxima of the Netherlands wore hot pink earrings -- and a ... fuzzy swim cap? -- on Thursday for a visit to the Architecture Museum Nagele in Urk. 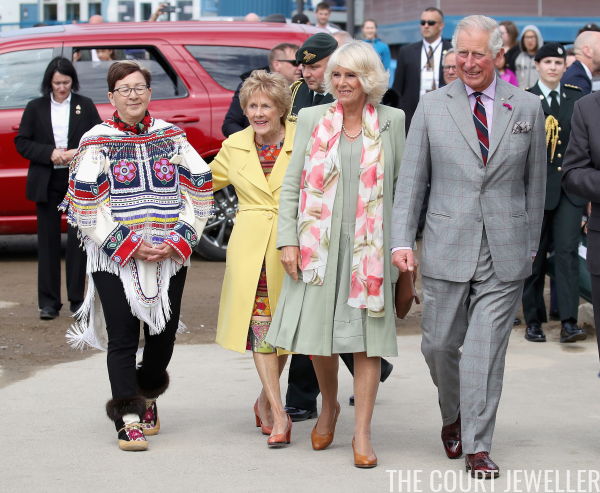 The Prince of Wales and the Duchess of Cornwall arrived in Iqaluit, Nunavut on Thursday to begin a three-day official tour of Canada, and both parties wore interesting accessories during the first day of engagements. 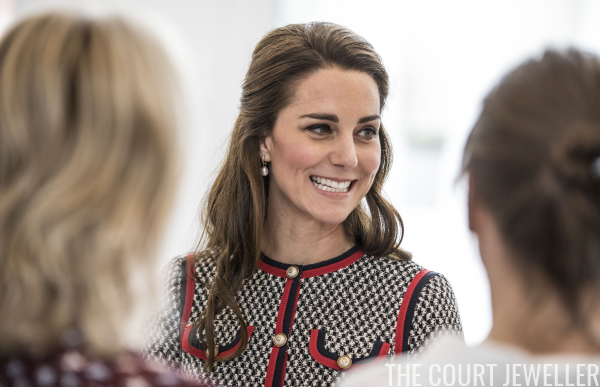 The Duchess of Cambridge visited the Victoria and Albert Museum in London on Thursday morning to view the museum's new Exhibition Road Quarter, and she brought a familiar pair of earrings with her. 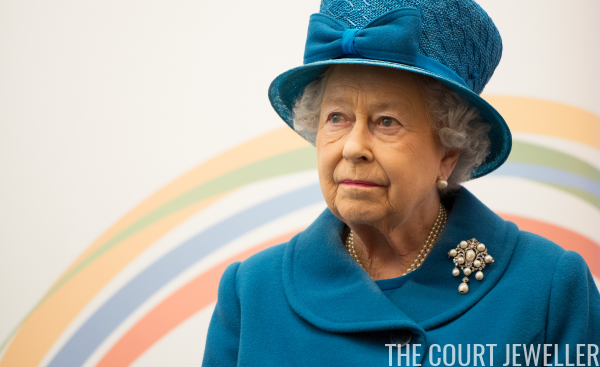 We're very used to seeing Queen Elizabeth II of the United Kingdom wearing pearls; she dons diamond and pearl earrings and a three-stranded pearl necklace for virtually all of her daytime engagements. 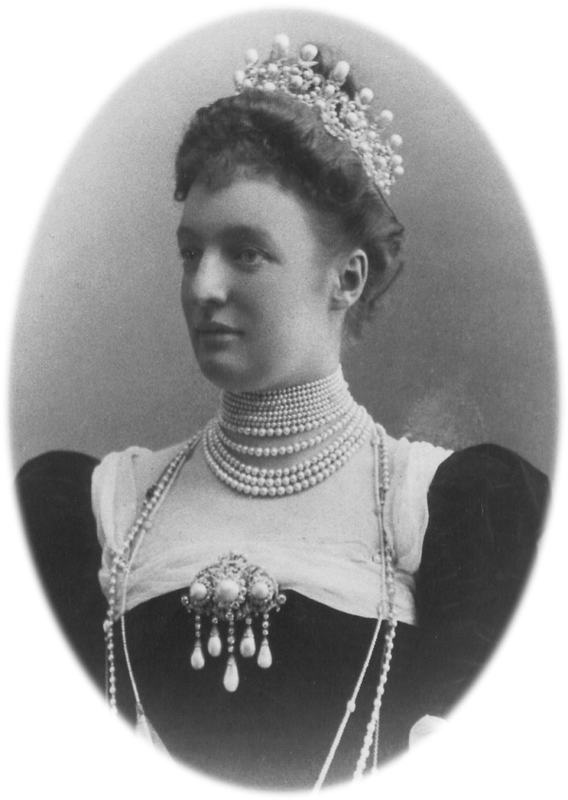 She also has numerous sets of pearls suitable for evening use, including today's suite of diamond and pearl jewelry, given to her by the Emir of Qatar. Photograph © Netty Leistra. Do not reproduce. While we were chatting about this weekend's Löwenstein-Wertheim-Freudenberg family wedding, my friend Netty Leistra, who is a freelance royal journalist based in the Netherlands, shared even more sparkling jewels from the family's collection with me. 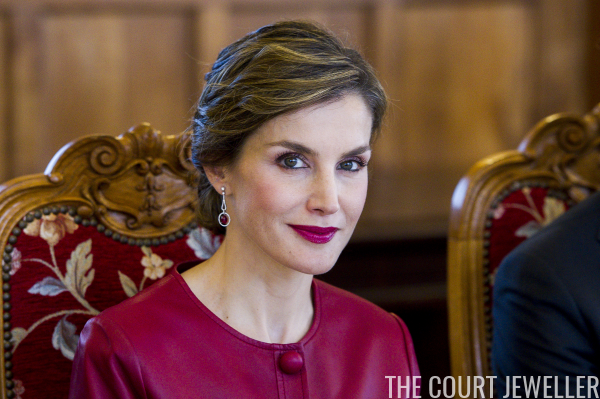 Time for another survey of the earrings that Queen Letizia has been wearing this week in Spain! Which pairs would you like to have in your own jewelry box? 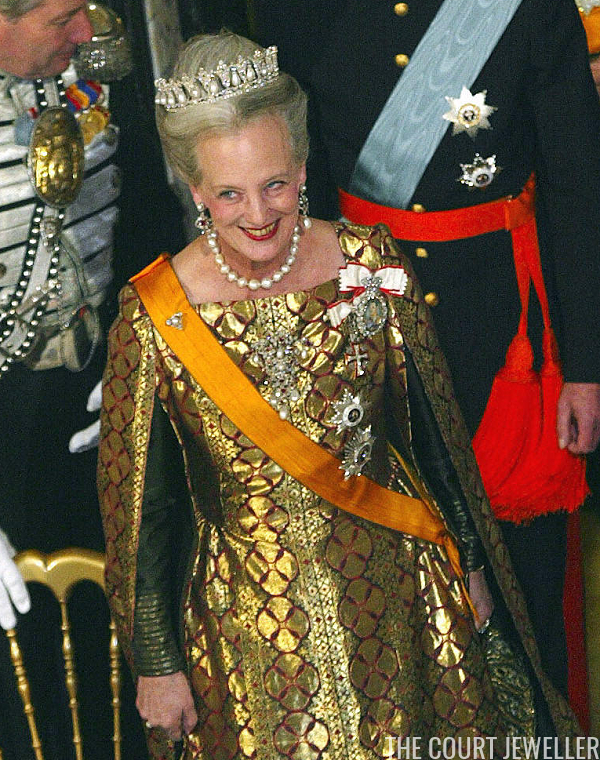 Queen Margrethe II of Denmark wears diamond and pearl jewels, including the Pearl Poire Tiara, during a state banquet for Grand Duke Henri of Luxembourg, October 2003; read more about the history of this tiara over here! Photograph © Stefan from Royal Travel and Events. Do not reproduce. 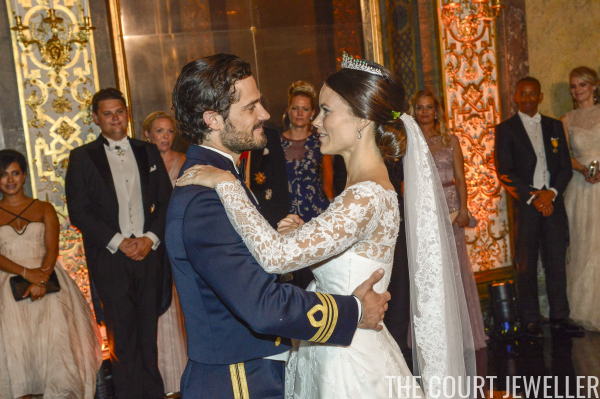 Earlier this week, I asked my Twitter followers whether they'd wear an emerald wedding tiara like the one worn by Princess Sofia of Sweden. 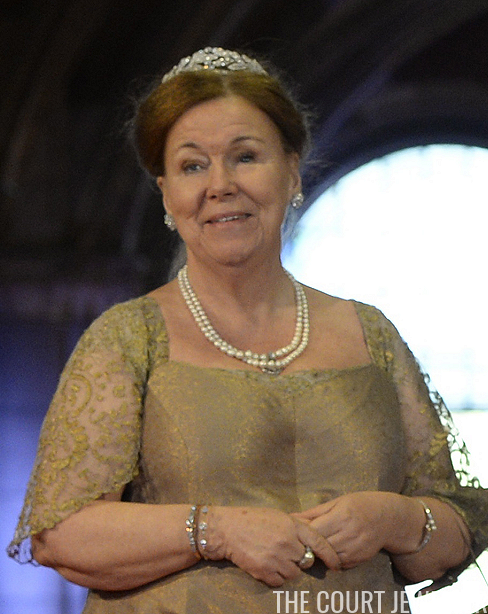 Coincidentally, this weekend brought a relevant tiara spotting in Germany: a wedding tiara set with diamonds and emeralds! 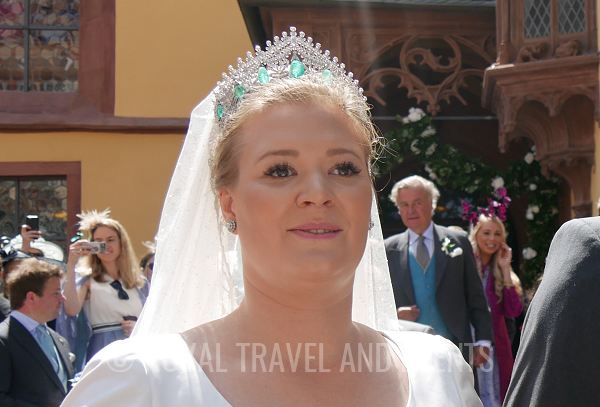 Here's the scoop on the unusual wedding tiara worn by Sophie, Princess zu Löwenstein-Wertheim-Freudenberg. 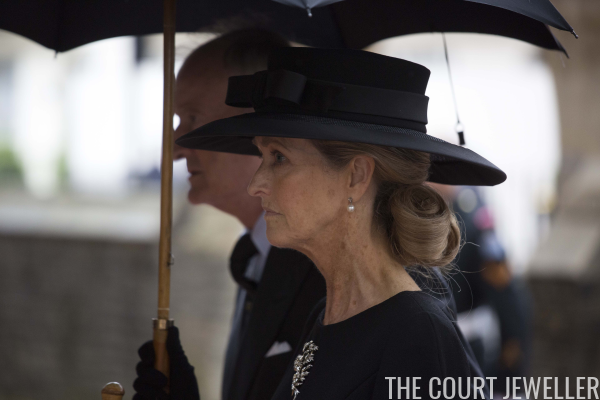 The Mountbatten and Windsor families gathered today at St. Paul's Church in Knightsbridge to celebrate the life of the late Patricia Knatchbull, 2nd Countess Mountbatten of Burma. Lady Mountbatten was the daughter of the famous Lord Mountbatten, the last viceroy of India, who was an uncle of the Duke of Edinburgh and a brother of Queen Louise of Sweden. Lady Mountbatten was the Duke of Edinburgh's first cousin and a godmother of the Prince of Wales. She was a formidable woman; she served in World War II, and she was one of the survivors of the IRA bombing that killed her father, her mother-in-law, and one of her sons. 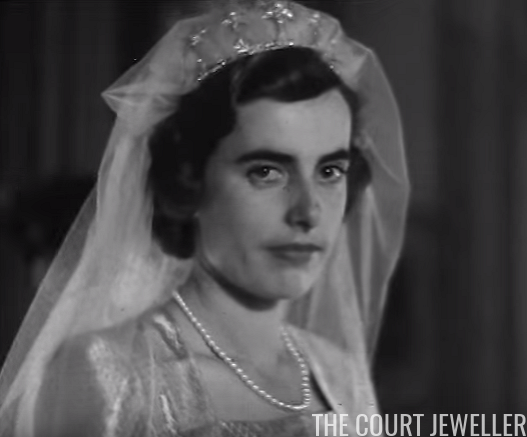 We covered her post-war wedding over here and chatted about her wedding tiara over here; today, we're glancing at some of the elegant jewels worn at her funeral service. Queen Maxima of the Netherlands, then Princess Maxima, wears the Antique Pearl Tiara in an official portrait taken by Erwin Olaf to mark her 40th birthday, 2011; read more about the history of the tiara over here! 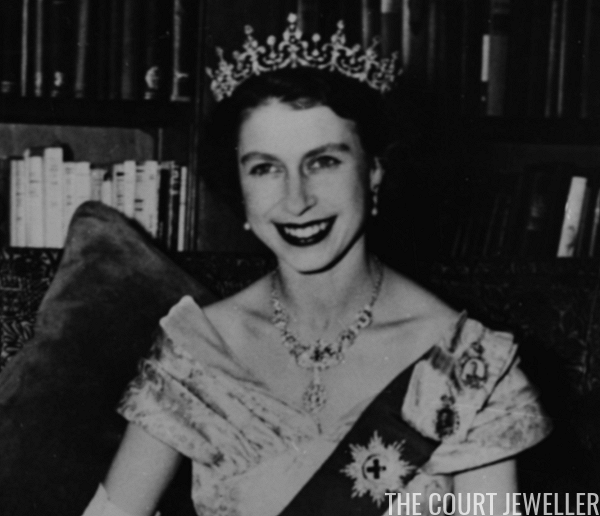 We're celebrating June's birthstone, the mighty pearl, all week here on The Court Jeweller, and today, we're counting down the best pearl brooches owned by one of the biggest royal jewel collectors of all, Queen Elizabeth II of the United Kingdom. Here's my list of the Queen's top ten pearl brooches -- let us know your top ten lists in the comments below! 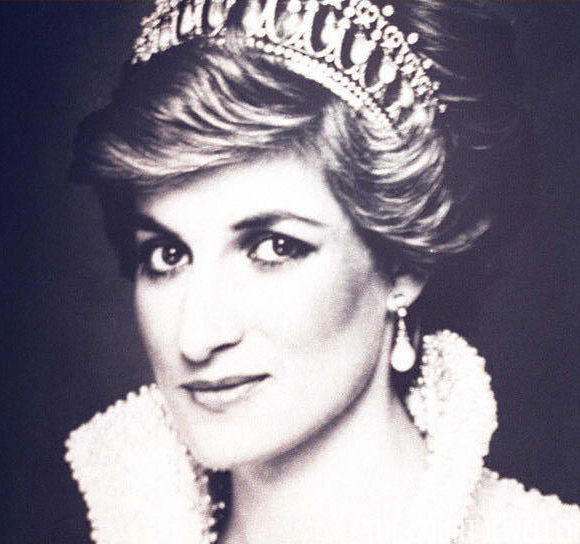 The late Diana, Princess of Wales is depicted wearing Queen Mary's Lover's Knot Tiara in a famous portrait, ca. 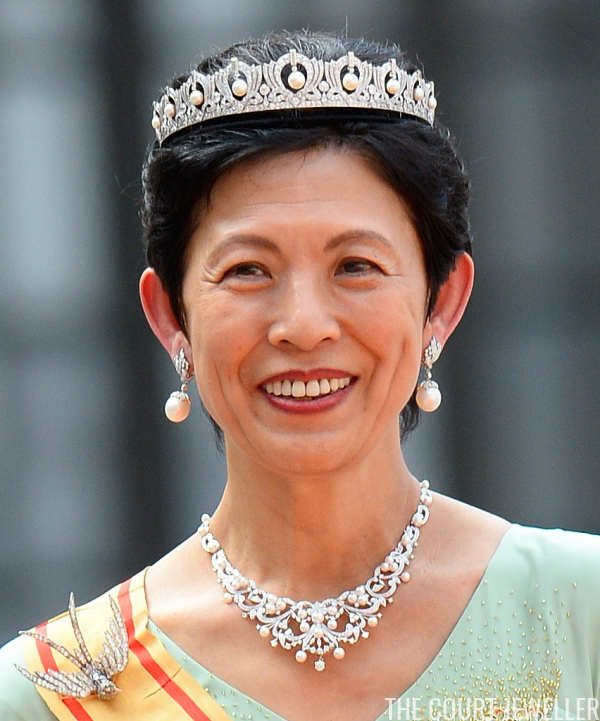 1990s; learn all about this tiara's history over here! Queen Elizabeth  is thinking of giving her long rope of splendid pearls a sea bath. They have been ill since she was stricken with fever and have lost much of their luster. 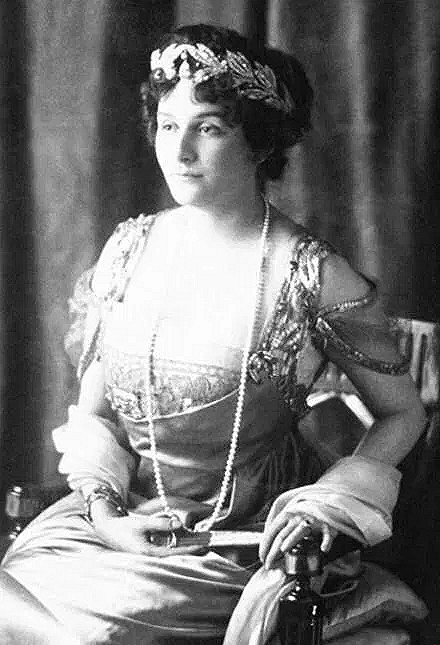 Hers is one of the finest collections in Europe, and of all her beautiful jewels the Queen cherishes the pearls the most. 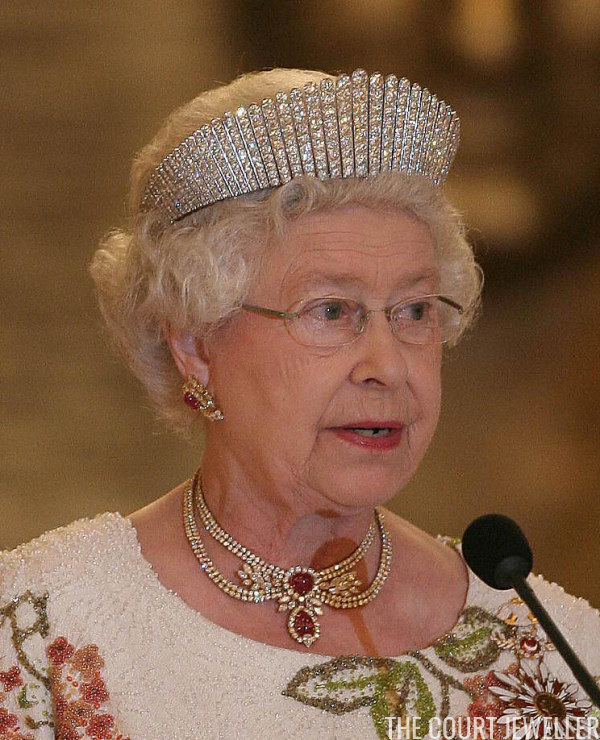 Queen Elizabeth II of the United Kingdom, Queen of New Zealand wears the Vladimir Tiara "widowed" (that is, without either the pearl or emerald drops) during a state dinner in Wellington, February 2002; learn more about the tiara over here! 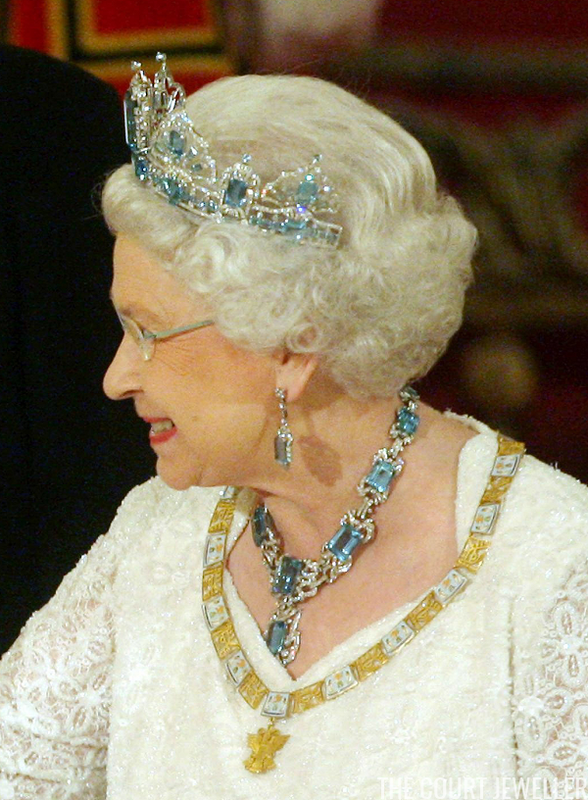 Queen Elizabeth wears the tiara and jewels from the Brazilian Aquamarine Parure at a state banquet for the President of Mexico, March 2009; read more about the suite of jewels over here! 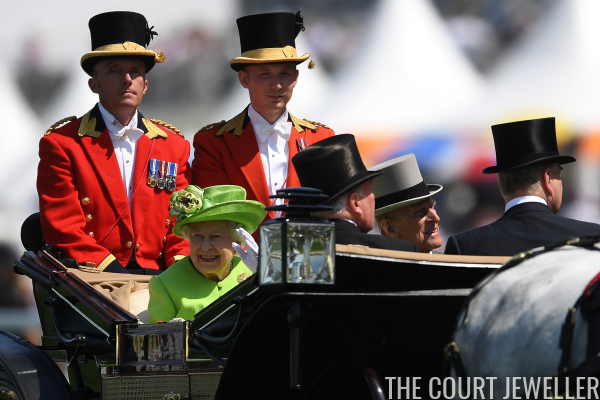 Royal Ascot wrapped up this morning with one more appearance from the Queen -- and a brooch we haven't seen in a while! 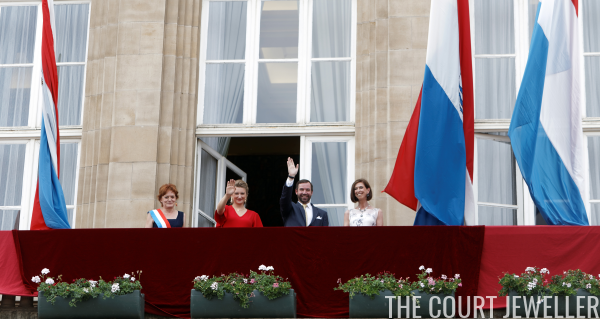 The grand ducal family of Luxembourg has been out and about at the end of this week to celebrate the country's national day. Here's a look at some of the jewels we saw, for both the daytime and evening engagements. 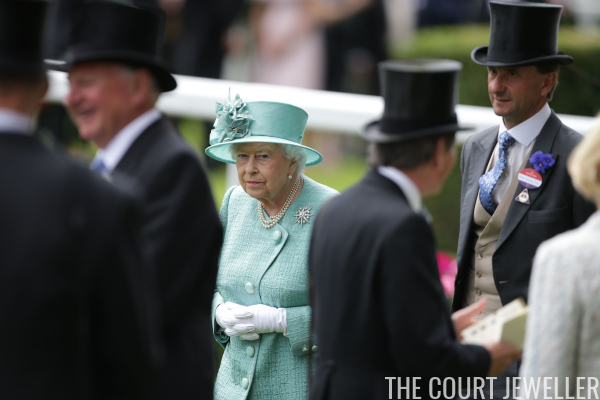 As the week goes on, the royal crowd at Ascot generally thins, but we've still got a few bejeweled royals (and former royals!) to share from today's races. 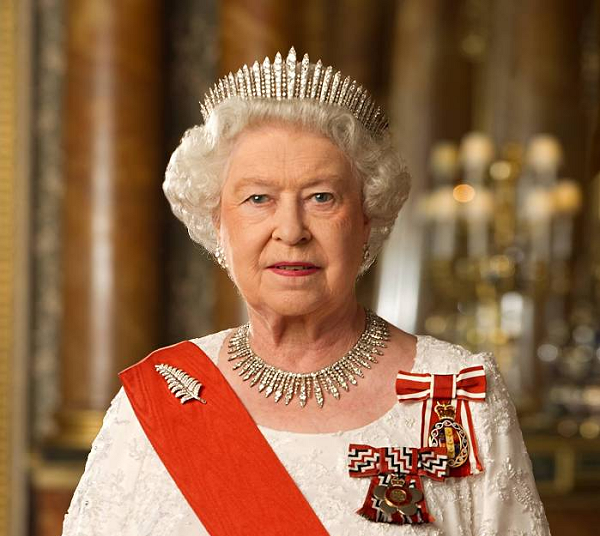 Queen Elizabeth II of United Kingdom, Queen of New Zealand, wears Queen Mary's Fringe Tiara with the City of London Fringe Necklace and the Silver Fern Brooch in an official Diamond Jubilee Portrait, ca. 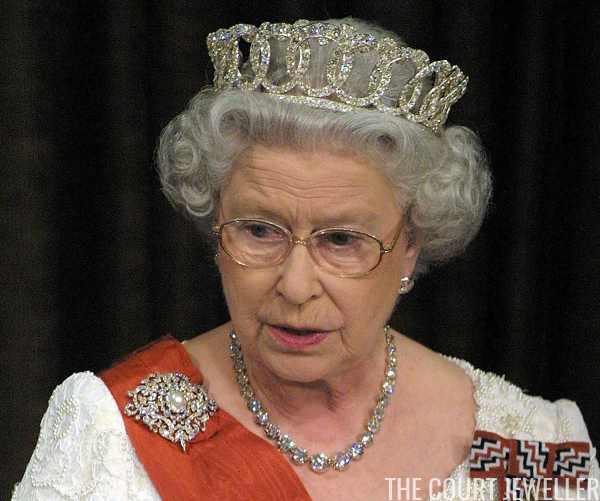 2012; read more about the tiara over here and the brooch over here! 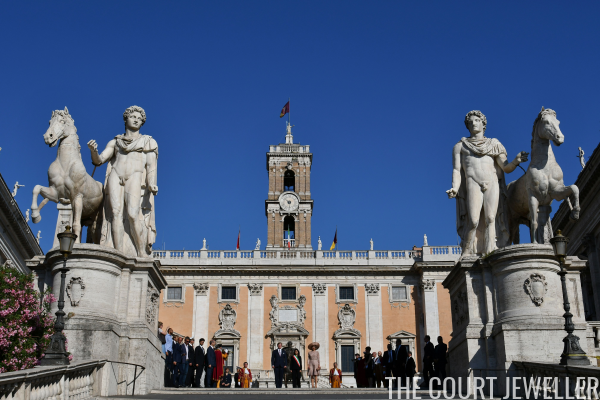 We were incredibly spoiled for choice this week where royal jewels are concerned, but here's my selection of the very best pieces of the week. Be sure to vote for your favorites in the poll below (and/or add your own list in the comment section)! 10. Queen Letizia of Spain chose her white gold and diamond starburst earrings from Yanes to attend a cultural program for schools in Aviles on Tuesday. 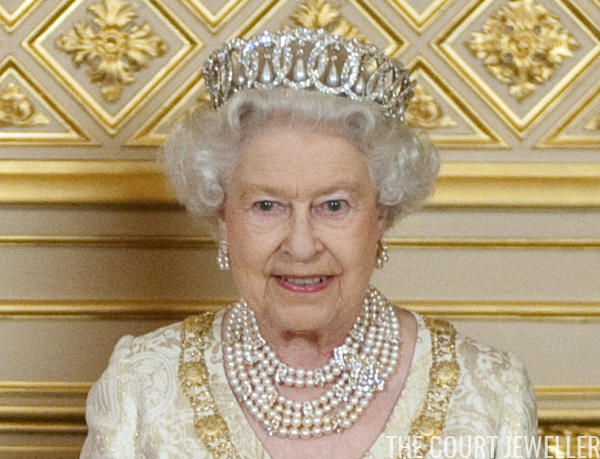 Queen Elizabeth II of the United Kingdom wears the Belgian Sapphire Tiara with pieces from the George VI Sapphire Suite at a state banquet for the President of Colombia, November 2016; read more about the tiara over here and the sapphire suite over here! 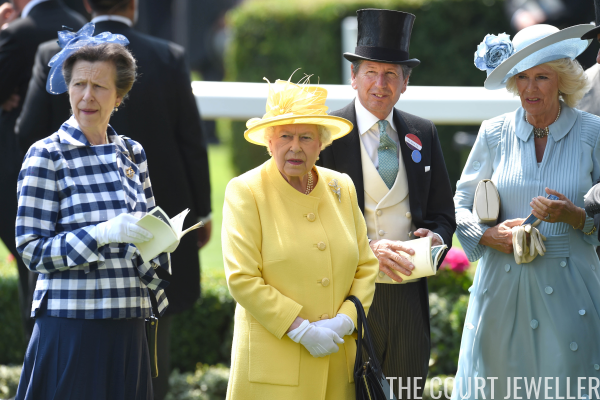 It's Ladies' Day at Royal Ascot, magpies! 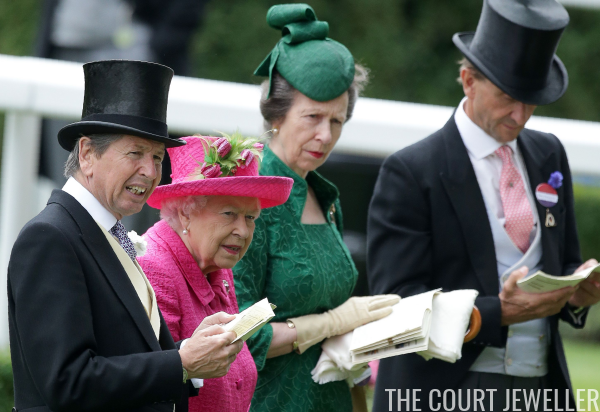 Time to enjoy the hats and jewels we saw on the third day of this year's races. For the last few years, royal women have favored major statement earrings as their primary eye-catching jewelry. But for this weekend's 57th annual Monte Carlo TV Festival, Princess Charlene of Monaco chose to make a statement with a major necklace instead. 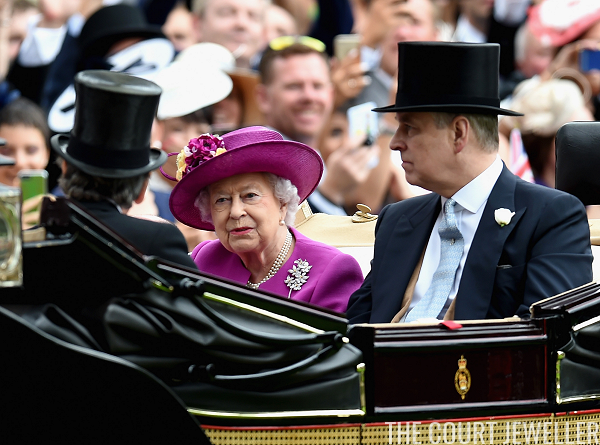 After the State Opening of Parliament wrapped up, the Queen headed back to join the rest of the royals for the second day of this year's Royal Ascot races. Here's a look at the jewels (and hats!) they wore. Queen Elizabeth II of the United Kingdom wears Queen Alexandra's Kokoshnik with the Qatari Rubies at a state dinner in Turkey, May 2008; read more about the tiara over here and about the ruby suite over here! 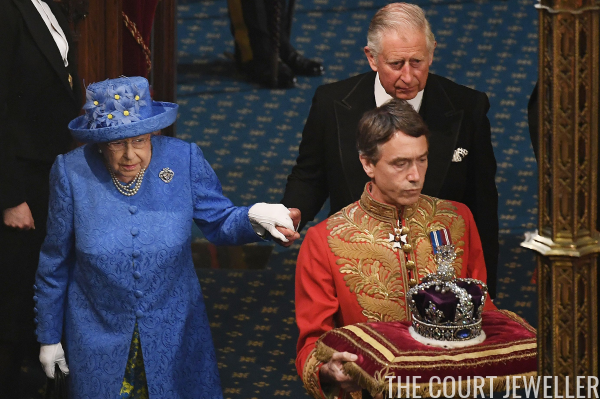 This morning, Queen Elizabeth II of the United Kingdom attended a scaled-back version of the State Opening of Parliament, where she delivered the Queen's speech in a hat and coat rather than her usual crown and robes. Tonight's state dinner in Italy may have been a black tie affair, but leave it to Queen Maxima of the Netherlands to bring us a tiara anyway! Keep reading below for all the details about the grand jewels she wore for the occasion. 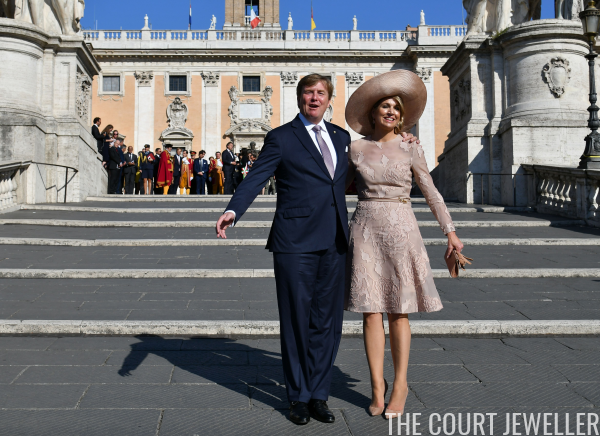 King Willem-Alexander and Queen Maxima of the Netherlands are on a state visit to Italy this week, and they began their program of engagements in Rome. And we're off! The races have begun at the 2017 Royal Ascot meet, and the royals were there wearing their best racing finery. 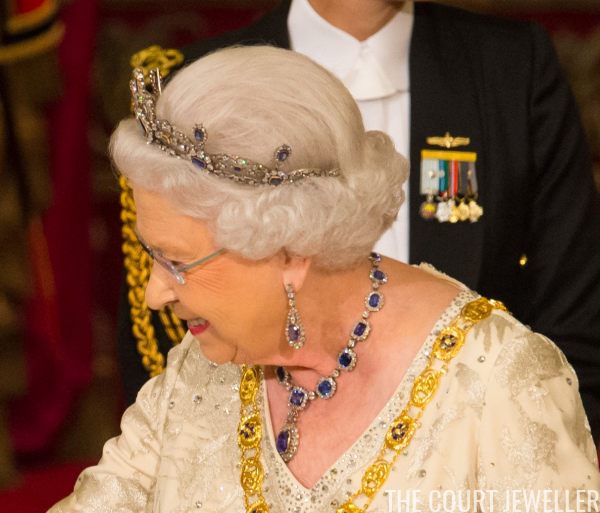 Here's a look at the jewels we saw on both the royal ladies and gentlemen today. Queen Elizabeth II of the United Kingdom (then Princess Elizabeth) wears the Girls of Great Britain and Ireland Tiara and the Nizam of Hyderabad Necklace at a dinner at the Canadian Embassy in Washington, D.C., 1951; read more about the tiara over here and the necklace over here! Today is the first day of Royal Ascot, one of the best weeks of the whole year for royal fashion and jewelry. (There's a reason I called it Hat Christmas back in the days of Mad Hattery!) Before we see the modern pieces worn today by the royals who attend the races, here's a look back at ensembles worn at Royal Ascot in days past. Which is your favorite Ascot era? 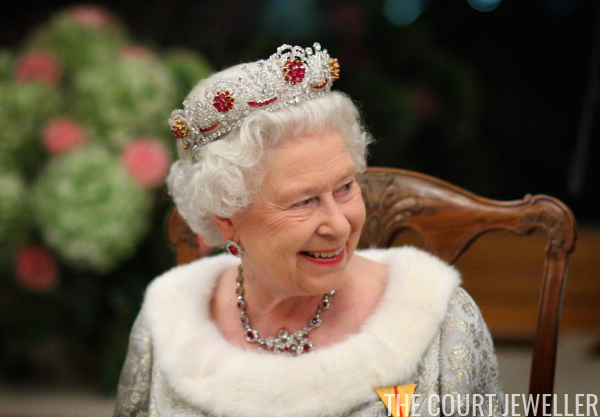 Queen Elizabeth II wears the Burmese Ruby Tiara at a state banquet in Slovenia, October 2008; learn more about this tiara's story over here! The insignia of the Order of the Garter which the King  has bestowed on King Frederick of Denmark  in a State visit to this country, in a spectacular ceremony in St. George's Chapel, Windsor, in the presence of Queen Elizabeth , Queen Ingrid , and Princess Elizabeth  had been chosen with care. 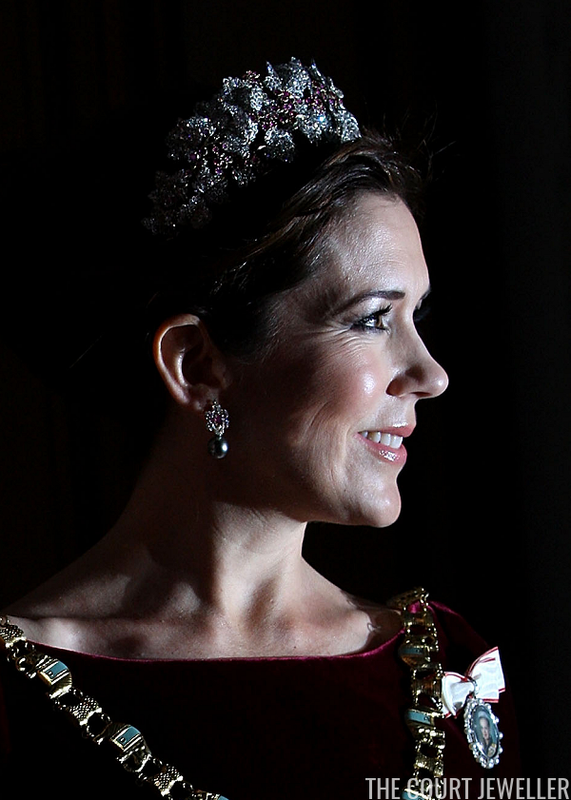 Crown Princess Mary of Denmark wears the Danish Ruby Parure Tiara at the New Year's Levee, January 2012; read much more about this tiara's long history over here! 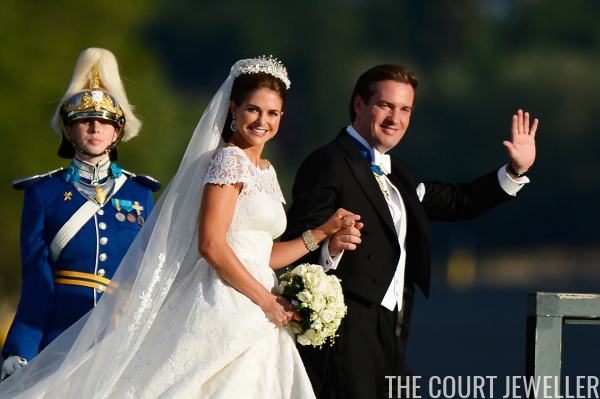 Today, our survey of Swedish royal wedding jewels arrives in 2013, when Princess Madeleine married Chris O'Neill in Stockholm. Here's a look at her gorgeous wedding jewels, glittering in motion! 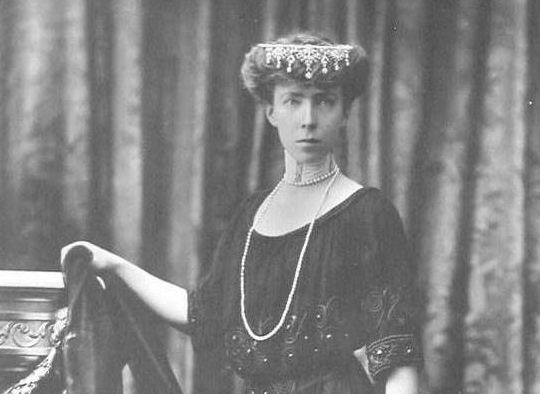 Princess Marie of Greece and Denmark (born Princess Marie Bonaparte) wears her olive wreath tiara in a portrait, ca. 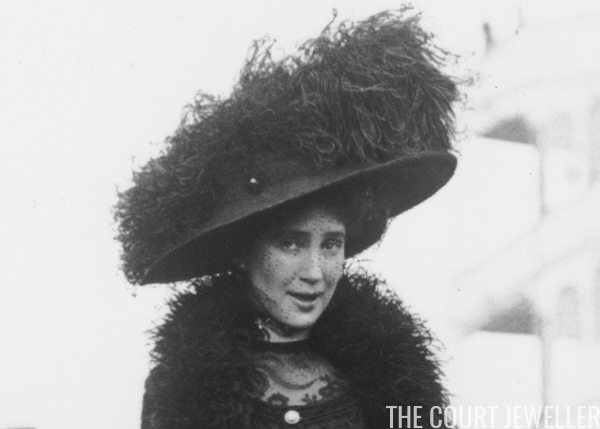 1907; read more about the tiara, and its fascinating wearer, over here! It's time again for the Queen's very merry unbirthday party, everyone! 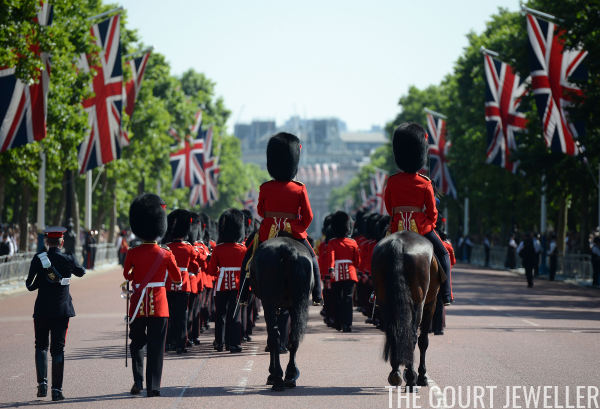 For the sovereign's official birthday parade and the Trooping the Colour exercises at Horseguards Parade, we've got plenty of jewels on display. On Wednesday, the Mountbatten family announced the passing of its matriarch: Patricia Knatchbull, 2nd Countess Mountbatten of Burma. 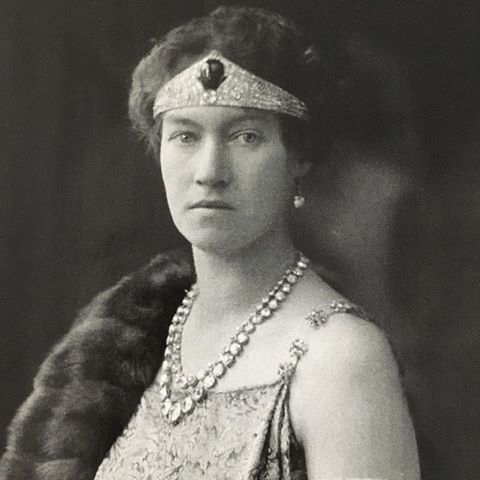 The elder daughter of Lord Louis Mountbatten was descended from the British and German royal families, with more family connections to the royal and imperial families of Sweden, Greece, and Russia. 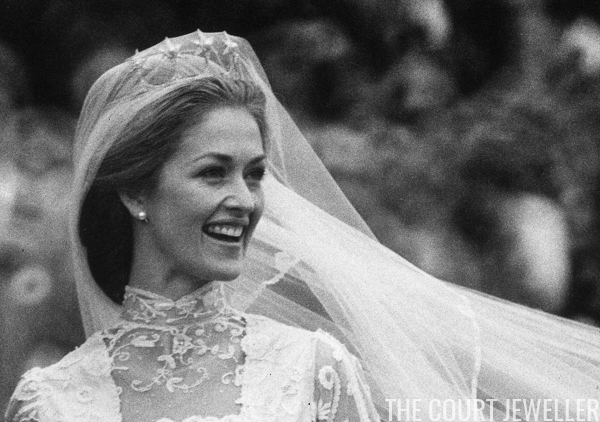 Today, to continue our celebration of her life, we're focusing on an interesting family heirloom: Patricia's wedding tiara. 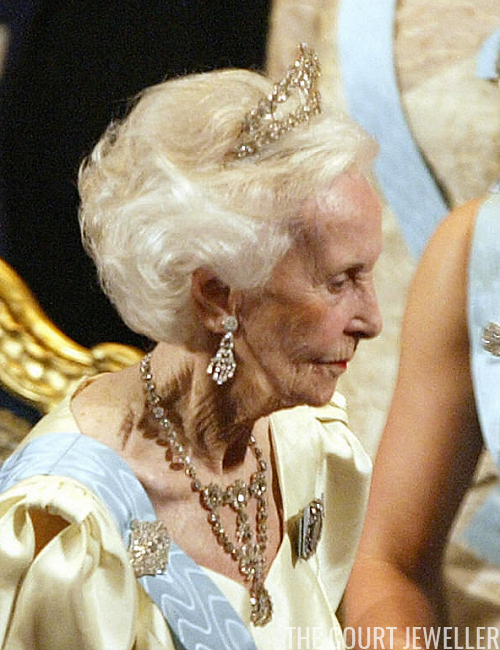 Princess Lilian of Sweden wears the Boucheron Laurel Wreath Tiara at the Nobel Prize Ceremony, December 2003; learn more about the tiara, which now belongs to Crown Princess Victoria, over here! 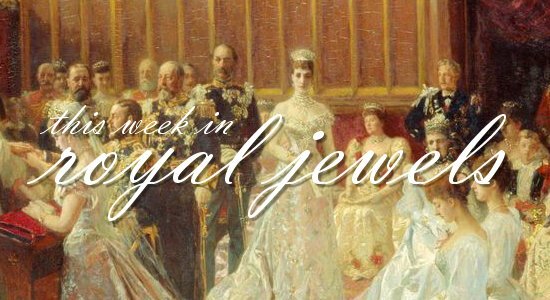 Lots to choose from in the world of royal jewelry this week! Don't forget to vote for your favorites in the poll below! 10. 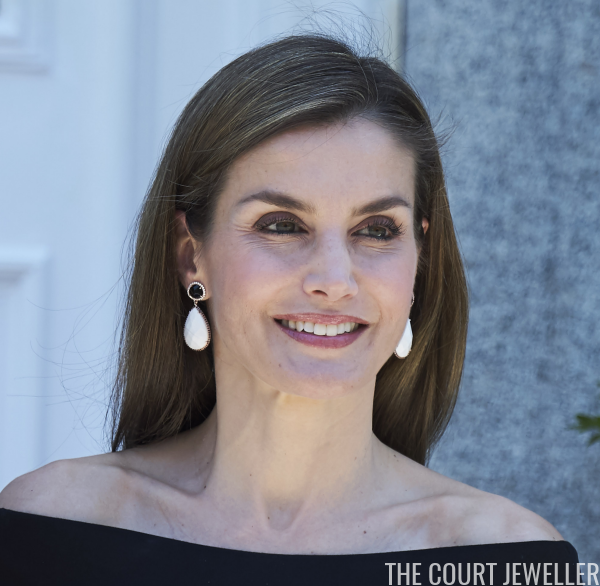 Queen Letizia matched white onyx and black onyx earrings from Coolook with a monochromatic dress to receive the President of Peru at Zarzuela Palace on Tuesday. 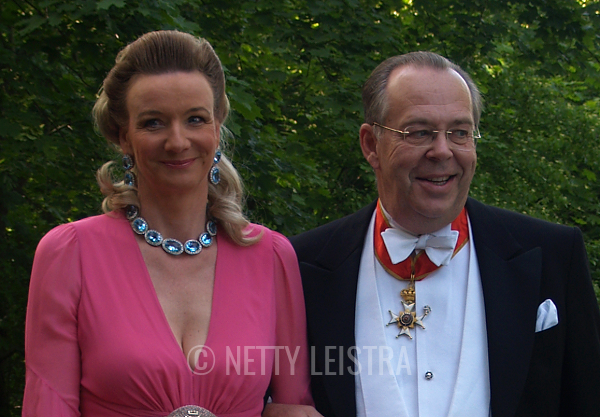 Princess Christina of the Netherlands, aunt of King Willem-Alexander, wears the Dutch Laurel Wreath Tiara at a dinner on the eve of his inauguration, April 2013; learn more about this classic tiara over here! "Beautiful Patricia Mountbatten Weds Capt. Lord Brabourne"
Romsey, Hampshire, England, Oct. 27 -- Lovely Patricia Mountbatten , daughter of one of Britain's foremost warriors , was married Saturday to Capt. Lord Brabourne  in the splendor of Romsey's Norman Abbey, and afterward King and Commoner toasted the couple whose wedding gave this ancient town the finest fete in its history.